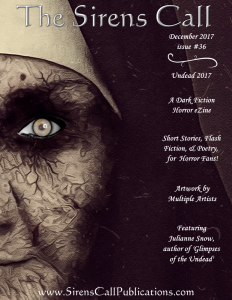 Thrilled to be part of this creepy zombie issue with my story 'Behind Glass'! At lunchtime, after four hours of achieving absolutely nothing, Tom decides to pack it in and go home. It’s the firm’s own fault, anyway. Old McKay makes such a fuss over sick time that everyone always crawls into the office no matter what’s wrong with them. And then, what with the dodgy air con recycling all the germs, everyone else immediately goes down with it. Today, the place looks like a ghost town. Even McKay himself hasn’t shown up, and if that isn’t a sign of the apocalypse Tom doesn’t know what is.